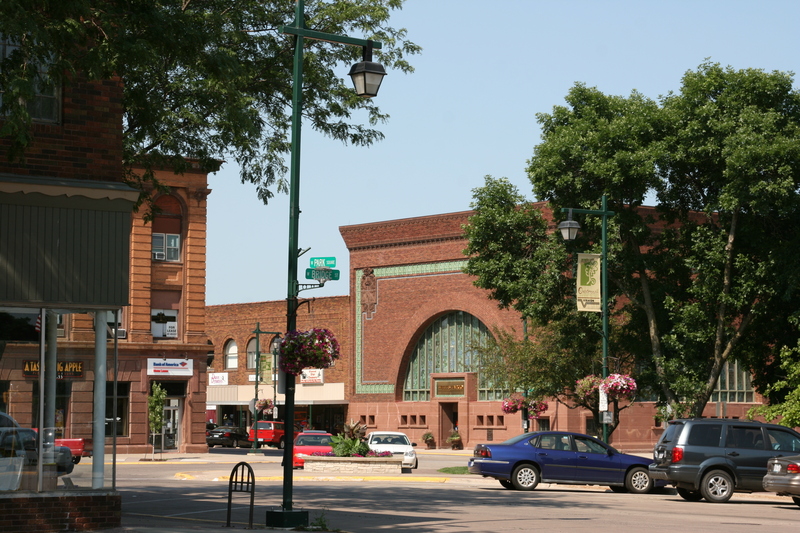 National Farmers’ Bank, Owatonna, MN | ride. travel. live. Wow! 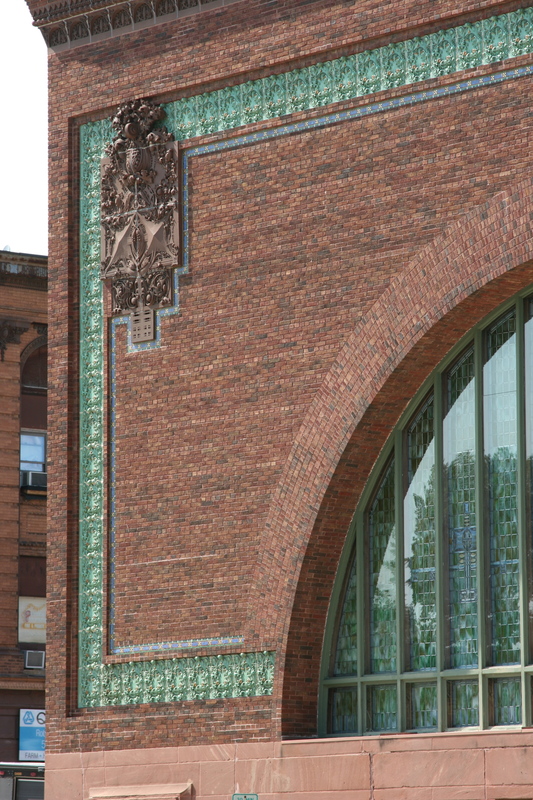 The last Jewel Box covered on this tour, this was Louis Sullivan’s first bank structure, and the grandest of them all. Located about 45 minutes south of Minneapolis in what is now transitioning towards a suburb, the bank is immediately recognizable by the massive arches on two sides of the building. A prominent, assertive cornice, and a base of ashlar gives this building real presence and solidity from the outside. 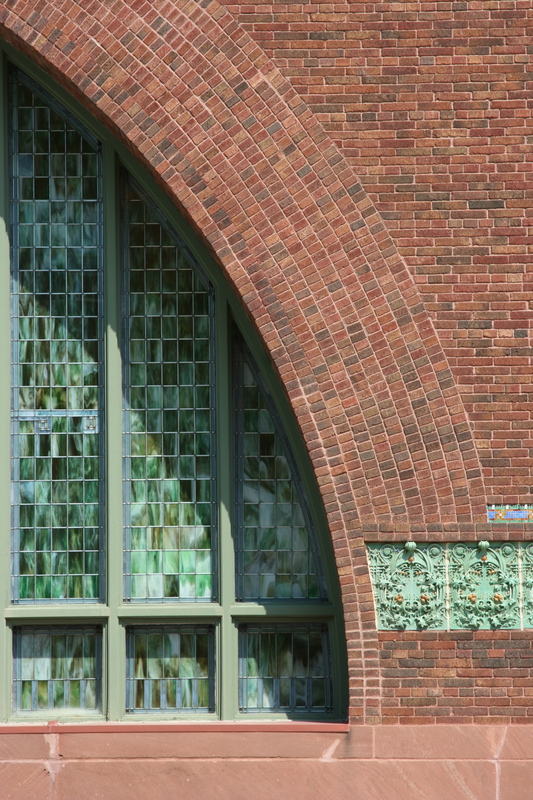 The exterior is also marked by boldly colored mosaic, in a thin line around the perimeter of the decorative elements. Not just another building in downtown Owatonna! 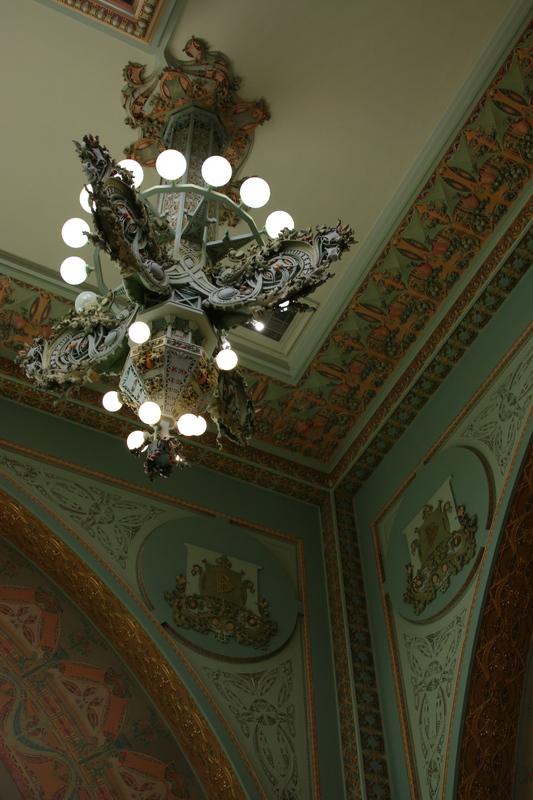 Inside is a dazzling composition, covered by a skylight that insures natural light all day long, a rich set of murals, large intricate lamps, and large panels of stained glass. It’s great inside and out, extravagant and rich with decoration (courtesy George Grant Elmslie), yet proportioned to fit in the small Midwest townscape. The building was completed in 1908, after his last skyscrapers in Chicago, and came during a period of declining fortunes and finances that would culminate in one of his darkest years, 1909, with the auction of most of his personal possessions, a sale that fell far short of what he expected, and his subsequent divorce. No doubt Sullivan had pissed off members of the architectural establishment and was reluctant to take on more lucrative residential commissions, and his individual style fell out of fashion, all of which contributed to his professional and personal tribulations. He didn’t want to design banks, but reluctantly accepted these commissions to earn much-needed cash. Whatever he felt about doing these commissions, Sullivan was able to just as successfully design these banks as he did with his skyscrapers during the previous phase of his career, in the last 15 years of the 19th century. It’s safe to say that no bank building will ever be built like this again.